Frasier ran from 1993 to 2004 and followed the life of Dr. Frasier Crane, who was forced to return to Seattle to care for his sick father. Over the years we fell in love with Frasier’s pomposity, Marty’s loveable dog Eddie and not forgetting the love story between Niles and Daphne. 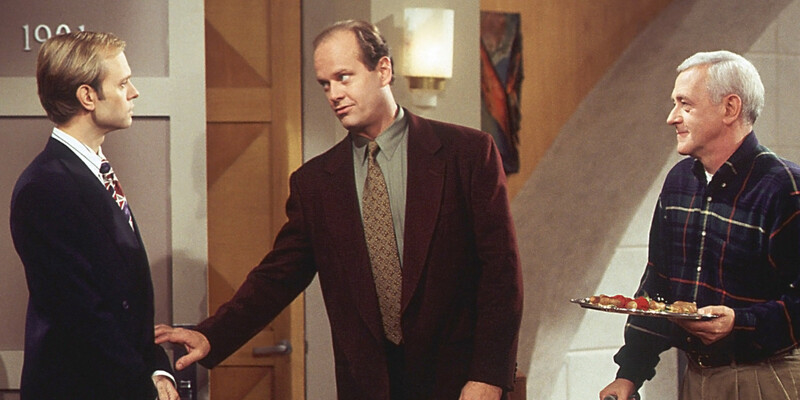 As it has been off our screens for 10 years now, The List Love thought it was about time we offered 10 Frasier facts to make you miss the TV show. The role of Roz Doyle originally went to Lisa Kudrow , as the producers believed she could make even the most boring lines sound funny; however, the writers had to re-write Roz’s character during filming. 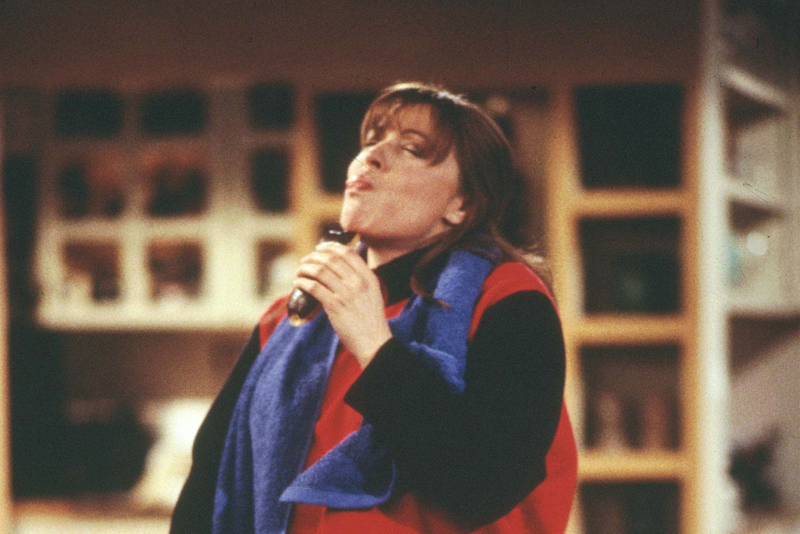 While Lisa was funny, the writers believed she couldn’t play the forceful character of Roz Doyle, and so she graciously left the role, which later went to Peri Giplin. We’re guessing landing the part of Phoebe Buffay just one year later eased the blow. Frasier Crane was a popular character in the sitcom Cheers, and the spinoff was born when writer and producer David Lee was forced to care for his elderly father who had recently suffered a debilitating stroke. 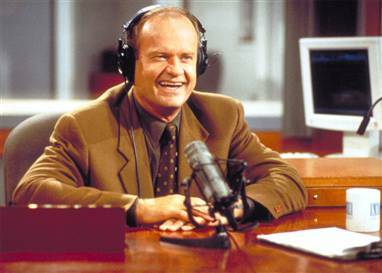 His real-life experience inspired him to reprise the role of Frasier and create a spinoff about the pompous doctor having to care for his father, Martin. 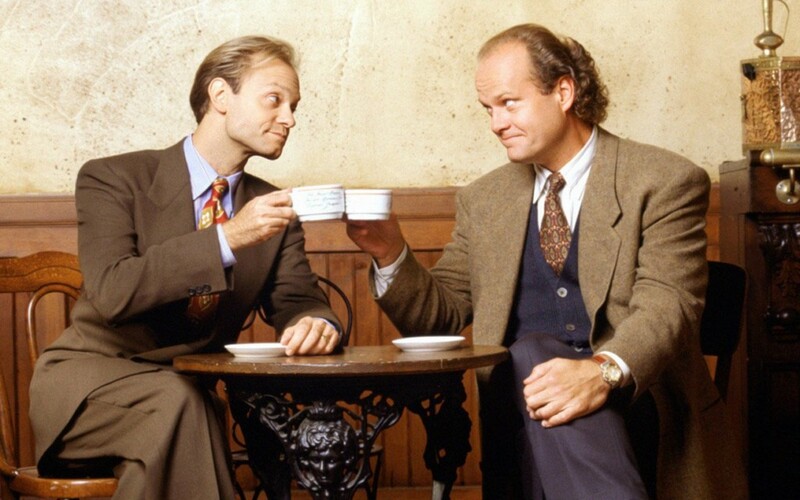 Frasier was set in Seattle as the producers wanted to avoid the show crossing over too much with Cheers, with many of the former characters regularly making special appearances. 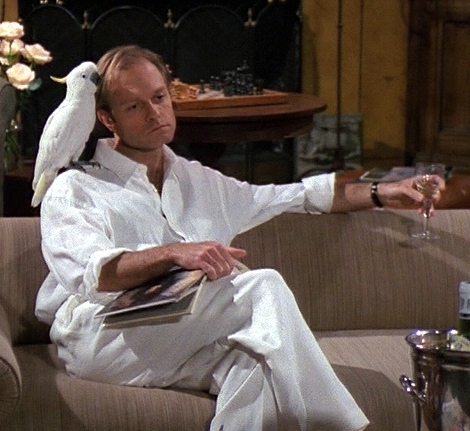 David Hyde Pierce, who plays the germ-obsessed Niles Crane, stated he had no particular interest in wine or opera prior to the series, despite his character’s love of both. Ironically, he was introduced to both by John Mahoney, which his character, Martin, loathed. 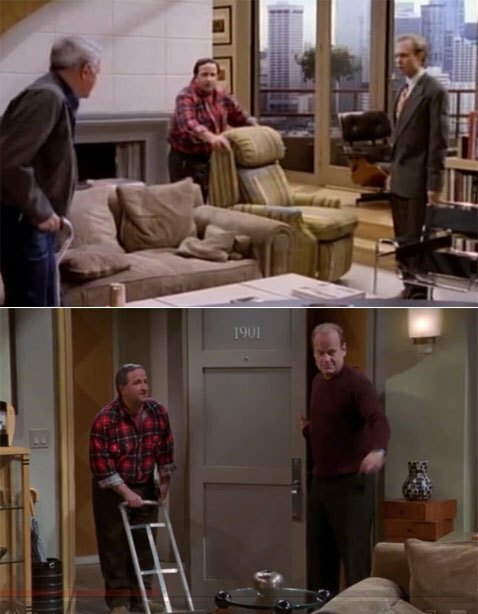 The delivery man (Cleto Augusto) who drops off Martin’s easy chair in the first episode is the same delivery man who takes it away in the final episode. He is the only person to appear in both episodes, aside from the regular cast. Daphne loses a reported 9lbs 12oz when she visits a health spa in season 8. This is an inside joke as Jane Leeves was on maternity leave during filming and her daughter’s birth weight was 9lbs 12oz. Who do you think go the most fan mail? Kelsey Grammer? Peri Gilpin? Jane Leeves? Nope. It was none of them. According to John Mahoney, Moose, the dog that played Eddie, received more fan mail than any of the human cast members. Kelsey Grammer (Frasier) had a rather unusual acting method that he called “requisite disrespect”. He rehearsed each scene only once and refused to learn his lines until moments before each scene was shot. He believed this brought a realism and energy to his performance. His fellow cast members and crew were used to this method, but many guest stars did not like it. John Mahoney may have played Frasier’s father but he is only 15 years older than Kelsey Grammer. 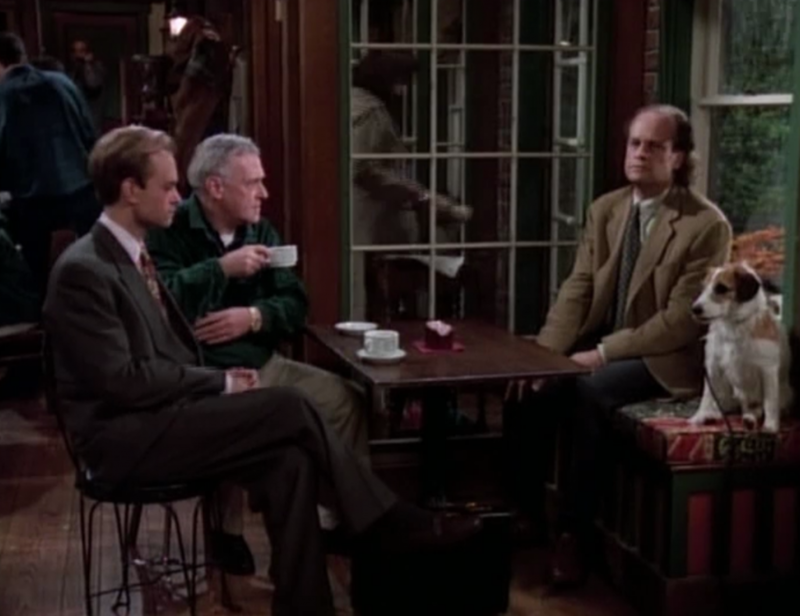 Most of the people that ring up Frasier’s radio show are voiced by celebrities, which include Kevin Bacon, Elijah Wood, John Lithgow, Ben Stiller, Helen Mirren, Cindy Crawford, plus many more. Most of the stars never came in to record a voice over and just phoned in their lines. Read more about your favourite sitcoms and check out these 10 Friends facts from The List Love. 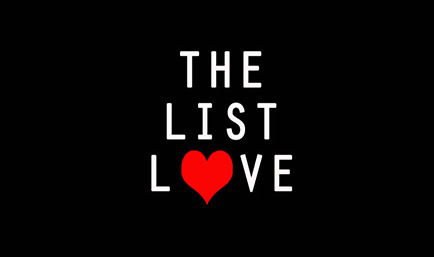 You can also like us on Facebook and Twitter to read our latest top 10 lists.